Luke 23:32-43. And there were led also two others, who were malefactors, to be put to death with Him. 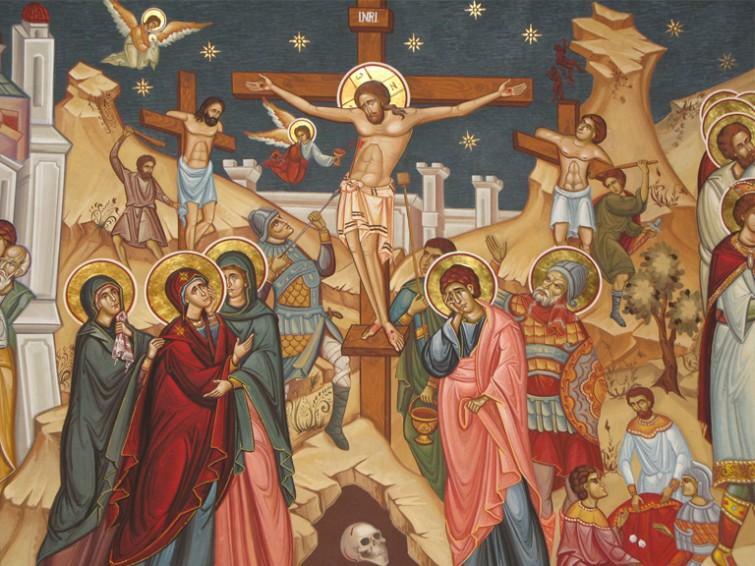 And when they came to the place which is called a skull, there they crucified Him and the malefactors, one on the right hand and the other on the left. And dividing His garments, they cast lots. And the people stood looking on. And the rulers also derided Him, saying, "He saved others; let Him save Himself if this is the Christ the elect of God." And the soldiers also mocked Him, coming to Him, and offering Him vinegar, and saying, "If You are the King of the Jews, save Yourself." And there was also a writing written over Him, "This is the King of the Jews." And one of the malefactors which were hanged blasphemed Him, saying, "If You are the Christ, save Yourself and us." But the other answered rebuking him, and said, "Do you not fear God, seeing you are in the same condemnation? And we indeed justly; for we receive the due retribution of our deeds, but this man has done nothing that is hateful." And he said, "Jesus, remember me when You come in Your kingdom." And Jesus said to him, "Verily I say to you, today shall you be with Me in paradise." The blessed Paul counts the mystery of the incarnation of the Only-begotten worthy of all admiration, and, so to speak, is in amazement at the wisdom and excellence of the plan of salvation, saying, "O the depth of the riches both of the wisdom and the knowledge of God." For consider how the Savior of all and Lord, by Whom the Father brought all things into existence, refashions man's nature, restoring it to that which it was in the beginning by becoming Himself like to us, and bearing our sufferings for our sakes. For the first man was indeed in the beginning in the paradise of delight, being ennobled by the absence both of suffering and of corruption, but when he despised the commandment that had been given him, and fell under a curse and condemnation, and into the snare of death, by eating the fruit of the forbidden tree, Christ, as I said, by the very same thing restores him again to his original condition. For He became the fruit of the tree by having endured the precious cross for our sakes, that He might destroy death, which by means of the tree had invaded the bodies of mankind. He bore suffering that He might deliver us from sufferings: "He was despised and not esteemed," as it is written, that He might make us honorable. He did no sin, that He might crown our nature with similar glory. He Who for our sakes was man submitted also to our lot; and He Who gives life to the world submitted to death in the flesh. Is not therefore the mystery profound? Must we not own that the dispensation is more than language can describe? What doubt can there be of this? Let us therefore, as we offer Him our praise, repeat that which was sung by the Psalmist's harp; "How great are Your works, O Lord! In wisdom have You made them all." When therefore He hung upon the precious cross, two thieves were hung with Him. And what follows from this? It was verily mockery as far as regards the object of the Jews; but the commemoration of prophecy, for it is written, that "He was also numbered with the transgressors." For our sakes He became a curse, that is, accursed, for it is written again, that "Cursed is every one that hangs on a tree." But this act of His did away with the curse that was upon us, for we with Him and because of Him are blessed. And knowing this, the blessed David says: "Blessed are we of the Lord, Who made heaven and earth," for by His sufferings blessings descend to us. He in our stead paid our debts, He bore our sins; and as it is written, "in our stead He was stricken." "He took them up in His own body on the tree," for it is true that "by His bruises we are healed." He too was sick because of our sins, and we are delivered from the sicknesses of the soul. He bore derision, and mockeries, and spittings: for the rulers of the synagogue of the Jews scoffed Him, shaking their polluted heads, and pouring out upon Him bitter laughter, as they said, "He saved others, let Him save Himself, if He is the Christ." But if you did not really believe that He was the Christ, why did you kill Him as the heir? Why did you wish to seize His inheritance? If He saved others, and you know that this indeed was so, how could He want the power to save Himself from your hands? You heard in the temple those whose office it was to sing and recite in chorus constantly chanting; "They pierced My hands and My feet, they counted all My bones, and themselves watched and gazed at Me. They divided My garments among them, and on My clothing did they cast the lot." And again, "They gave gall for My eating, and for My thirst they gave Me vinegar to drink." Since then you were learned in the law, - for such you considered yourself to be, - how came you to leave prophecy, and what had been foretold concerning these things unexamined? It was your duty to have enquired Who it was that spoke these things; to Whose person, I mean, you should have referred these verses. You heard your great chieftain Moses foretelling the savageness of your attacks: for he said, that "you shall see your Life hanging upon a tree," you shall see, that is, Him Who is the cause of life, or rather Life Itself, hung upon a tree. And how then did you entirely disregard the prophecy of Moses, of whom you made so great boast? For we have heard you expressly declaring, "We are Moses' disciples." Tell me what you mean by shaking your head at Him? Is it the meek endurance of the Sufferer that you despise? Or is it to prove the stony hardness of your mind? Are you eager to subject the Prince of Life to the death of the flesh? Why meddle you with holy cares? Why purpose you a counsel that you will not be able to establish? "He that dwells in heaven shall laugh at them, and the Lord shall deride them," as it is written. Two thieves therefore were hanged with Him, as I said, in mockery even of the passion which brings salvation to the whole world, but of these, the one, it says, resembled in his conduct the impiety of the Jews, belching forth the same words as they did, and giving free utterance to blasphemous expressions. "For if," says he, "You be the Christ, save Yourself, and us." But the other, following a different course, is justly worthy of our admiration, for he believed in Him. And while suffering so bitter a punishment, he rebuked the vehement outcries of the Jews, and the words of him who was hanging with him. He "confessed his sin, that he might be justified;" he became the accuser of his own wicked ways, that God might remit his guilt; for it is written, "I said that I will confess of myself my iniquity to the Lord, and You forgave the wickedness of my heart." He bore to Christ a blameless testimony, and reproved the Jewish want of love to God, and condemned the sentence of Pilate: "For this Man," he says, "has done nothing that is hateful." O how beautiful is this confession! How wise the reasonings, and how excellent the thoughts! He became the confessor of the Savior's glory, and the accuser of the pride of those who crucified Him. What reward therefore did he receive? Of what honors was he counted worthy? Or what benefit did the thief gain who was the first to profess faith? He lit upon a treasure worth having; he became rich unexpectedly, and possessed of every blessing: he won the inheritance of the saints, and to have his name written above, in heaven. He was in the book of life who was bearing the sentence of death, and is numbered with the dwellers in the city that is above. And let us look at his most beautiful confession of faith. "Jesus," he says, "remember me when You come in Your kingdom." You see Him crucified, and call Him a king, Him Who was bearing scorn and suffering, you expect to come in godlike glory. You see Him surrounded by a multitude of the Jews, and the wicked gang of the Pharisees, and Pilate's band of soldiers, - all these were mocking Him, and no single one of them confessed ... [the manuscript ends here].